What exactly are milia bumps? What are some of the causes of Milia bumps under eyes? Get an overview of the causes, treatment and various preventive measures. What are these Little White Bumps under my Eyes? In many occasions, if you experience little white bumps on your skin or eyes, you are likely to get alarmed on whether they are pimples or something else. Many people usually mistake these little white bumps under eyes for acne or a medical complication. The truth of the matter is that these white bumps are not acne-pimple but they are referred to as Milia bumps. One of the easiest way of differentiating, if it is an acne-pimple or something else is how they feel. Unlike acne-pimple, these white bumps are firm and any kind of squeezing has no impact of breaking them at all. Also unlike the usual acne-pimples, milia bumps can show up around the eyes and many parts of the face where there are no active oil glands. Lastly, milia bumps are not associated with any pain that is usually associated with ace-pimple. Primary Milia– Which occur due to trapped keratin beneath a person’s skin. Juvenile Milia– This type of milia is caused by genetic conditions such as basal cell nevus syndrome, gardner syndrome among others. Milia En Plaque– This is a type of milia that is associated to autoimmune diseases. 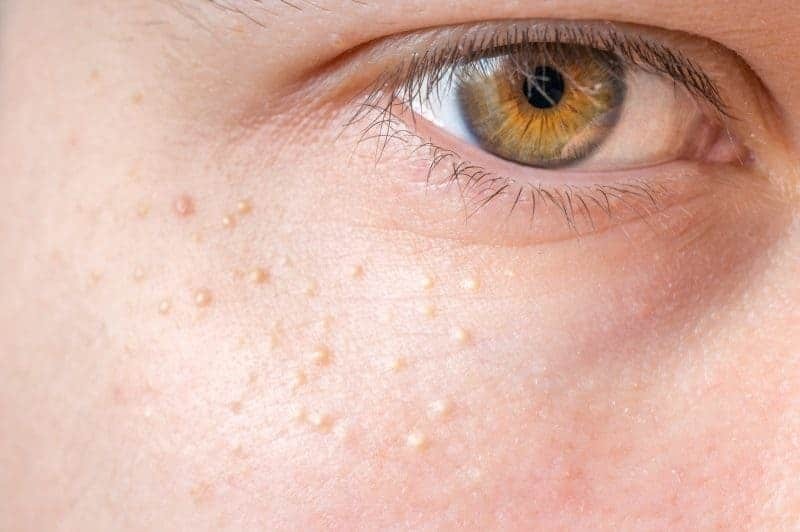 Multiple Eruptive Milia– This type of milia is usually accompanied by itchiness. Traumatic Milia– This is milia that form due to injury to the skin. Milia Associated with Drugs– This type of milia occurs due to excess usage of a drug such as steroids. There are Cosmetics and moisturizers such as eye creams, eyeshadows and make-ups that are oil-based may also contribute to milia formation because they can clog the oil glands in the eyelids. It is important and advisable to ensure that you wash off your make up every evening before going to bed. Xanthelasma is painless yellow bumps around the eyes. The yellow bumps are fatty deposits that are found beneath the skin. This condition is usually common in women aged 45 years and above. It is also important to note that this condition is common in Asian and Mediterranean countries and that the condition is hereditary and quite harmless, but in case you are concerned about it, you need to visit your doctor for blood cholesterol test. Lack of vitamins such as vitamin A and lack vitamin C has been associated with milia formation under eyes. Also, a diet rich in fats, cholesterol and proteins can also result in milia formation. To ensure your skin is free from milia, eat diets such as green vegetables, fruits, and whole grain. Avoid or minimize the intake of foods with high levels of cholesterol such as egg yolks and margarine. Excess exposure to the sun is also a factor that can cause milia formation. When skin is exposed to the sun it thickens, making the skin to lose its natural exfoliation ability, this makes dead skin cells, oil, debris and dirt to get trapped in the layers just below the surface, resulting to milia. The process of skin thickening as a result of sun exposure happens over a long period of time and sometimes it occurs naturally due to age factor. The buildup of dead skin cells can also be a contributing factor of milia. In many cases, skin buildup on the face is usually due to lack face washing. On daily basis, the body skin sheds thousands of dead cells, however, if these cells are not washed off the skin, they become trapped inside the cavities and pores in the skin, thus clogging pores and creating milia cysts. Chalazia is a clogged oil gland that usually occurs as a white bump on the eyelid. Chalazia usually begin as a small, small painful bump that becomes less and less painful as the bump continues to grow. This condition can appear on both sides of the eyelids. In many cases, chalazia do not need treatment as it usually goes away on its own within a period of one month. There is also a high probability that the white spots under your eye could be a pimple. Pimples are usually caused when pores become clogged with sebum, dirt or bacteria. 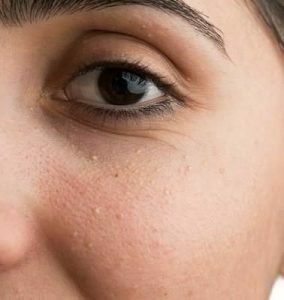 Pimples are much bigger than milia, they are slightly yellow in appearance. They can also be due to hormonal changes or fluctuations or they may be as a result of allergies. It is advisable that if the pimples around your eye are causing a lot of discomforts, you need to visit your doctor for consultation and treatment options. There is no treatment for small white bumps (milia) for infants, children and adults. Milia bump will usually clear up on their own with a few weeks of their formation. There are some home remedies that can be used to effectively eliminate these bumps if they are causing any form of discomfort. Recently doctors have been doing treatment for Milia that’ll get rid of Milia almost instantly. Most importantly the treatment is inexpensive. For a small amount of Milia, it can cost only about 100 USD (prices may vary)! Milia are usually harmless and in most cases, they will eventually clear by themselves. In infant and young adults they clear after a few weeks. However, in some people, milia can persist for a month or sometimes longer. Some types of milia such as secondary milia that occur as a result of a burn or a blistering rash or due to corticosteroid creams are sometimes permanent. If milia are very small or very tiny, you can use a needle to prick the skin and pinch the spot between your index finger and thumb. You can also prick it between 2 cotton-tipped swabs. However, if the milia are sitting high on the skin or larger in size don’t attempt to prick them by yourself, you may end up complicating the milia, it can end-up with bruising, redness, swelling and filled-up with some pus. Therefore, it is advisable to see visit a dermatologist or an aesthetician. Use a sunscreen to protect your skin against the harsh rays of the sun. Drink a lot of water, juices and herbal teas such as green tea, which is capable of detoxifying the body naturally. Avoid using cosmetics and creams which are oil-based. Use exfoliating products such as moisturizers containing salicylic acid. These help to make your epidermal skin layer to remain thin thus preventing the formation of these bumps. There are many home remedies that can be used to treat milia under eyes. Below are some of the home remedies, choose one among them that you will find to be convenient or affordable. Why Jojoba Oil and Honey? Honey is a very powerful remedy when it comes to skin ailments. It contains antioxidant and humectant properties that enable the skin to retain moisture and avoid dryness. On the other hand, Jojoba oil has moisturizing and antibacterial properties that help to a great extent to get rid of milia. Mix 2 tablespoon of honey and 1 tablespoon of Jojoba oil. Apply the mixture on your face and allow it to sit for at least 20 minutes. Repeat this process 2 times daily till milia goes away. The mixture of cornstarch and Apple Cider Vinegar is very effective in getting rid of milia under eyes especially the white head-type milia. Cornstarch works by absorbing excess oil while vinegar works as an astringent. Take 1 tablespoon of vinegar and mix with 1 teaspoon of apple cider vinegar to make a paste. Apply it on the affected area and leave it on for at least 30 minutes. Repeat this application till you get rid of the milia bumps. Why Tea Tree Oil and Rose Water? Tea tree oil has antibacterial and humectant properties due to the presence of terpenes. This property helps to dry the white bumps under eyes and help in cleaning the clogged pores. Rose water on the other hand act as a cleaning agent, it removes oil and dirt present in the cysts, thereby helping to get rid of milia. Clean your face and eyes using rose water. Apply tea tree oil on the affected parts. Leave the remedy to sit overnight. Rinse your face with lukewarm water in the morning. Repeat the application, daily till you get rid of milia. Why Castor Oil and Olive Oil? Castor oil has antibacterial and antiseptic properties that help castor oil to be effective in removing dirt present in the clogged pores of the skin. Due to this property, its application can help to get rid of milia- bumps under the eyes. Olive oil has moisturizing and soothing properties hence when used in combination with castor oil it gives strength and effectiveness to castor oil in the process of getting rid of milia under eyes. Mix 1 tablespoon of castor oil with 1 tablespoon of olive oil. Apply the mixture on the affected area and let it soak the oil for at least 30 minutes. Wash your face with lukewarm water and then pat dry. Repeat this application 2 times a day to get rid of milia under your eyes. Aloe Vera contains soothing, anti-inflammatory as well as antioxidant properties which assist to get rid of milia easily. It also assists to open up the clogged skin pores. Take an aloe Vera plant leave and cut it open to extract the gel out of it. Massage the affected area with this gel. Repeat this process on a daily basis till you get rid of milia under the eye. Why sandalwood and Rose Water? A combination of rose water and sandalwood assist to draw away the excess oil and get rid of the dead skin cells, thus reducing milia under eyes. Mix 2 tablespoon of the sandalwood powder with few drops of rose water to make a paste. Massage the affected area with this paste and leave it on for at least 20 minutes. Wash it off using cool water and then pat dry. Repeat this process daily for a few weeks. Fenugreek leaves are majorly used in Ayurveda as a beauty agent to get rid of milia, blackheads, boils and blemishes. Fenugreek leaves have antiseptic, anti-inflammatory and anti-oxidant properties. Grind some fresh fenugreek leaves with some little water. Leave it on for at least 15 minutes and then wash it off. Repeat daily until the white-milia bumps are gone. Roasted pomegranate peel powder has antioxidant and exfoliating properties. It also has high amounts of vitamin C which makes it a good remedy for skin ailments. Roast a handful of pomegranate peels, until they become brittle and dark in color. Crush the leaves into powder form. Add 3 drops of lemon juice or Rosewater to make a paste. Gently rub the paste on your face and allow it to sit for at least 15 minutes, before rinsing it off. Repeat this application 4 times a week. Soak a clean towel in hot water and wring out the excess water. Place the towel on your face for a few minutes and then remove it.